Tim Hortons and retailer Canadian Tire do an exceptional job associating themselves with youth sports in Canada based on unaided recall scores, according to Solutions Research Group’s Canadian Youth Sports Report, the most comprehensive, independent study ever undertaken on kids and youth sports in Canada. 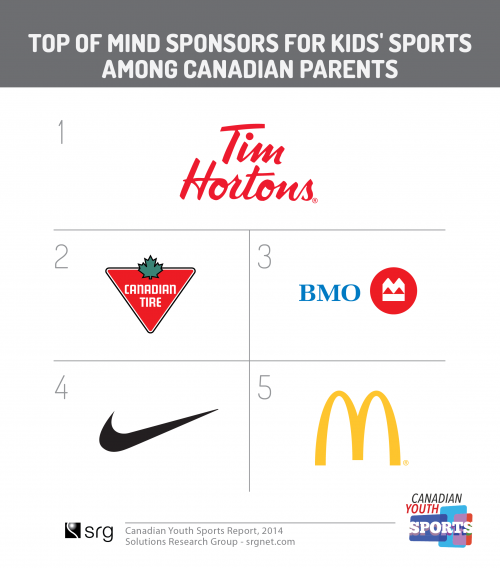 Tim Hortons was top of mind for 42% of Canadian parents when asked to name companies who sponsor kids and youth sports activities, making it the #1 brand in Canada among parents of kids and youth in the 3-17 age range. Canadian Tire came in at #2, followed by, BMO, Nike and McDonald’s rounding out the top five. The next five brands parents mentioned included Scotiabank, RBC, Adidas, SportChek and Gatorade. Tim Hortons and Canadian Tire were #1 and #2 in both English Canada and Quebec. In Quebec, Nike, McDonald’s and Desjardins rounded out the top five, while BMO came in at #3 followed by Nike and McDonald’s in English Canada. Tim Hortons’ recall was strongest among parents who had their kids in hockey, while Canadian Tire did well in basketball as well as hockey. BMO’s recall rate was highest among soccer parents, while SportChek received its highest scores among parents with kids in snow sports. In terms of engagement metrics, 84% of parents could recall at least one brand supporting youth sports. Half of parents (50%) mentioned 2 or more brands, suggesting a high level of engagement. Parent of boys in organized sports mentioned more sponsor brands top of mind compared to parents of girls and this pattern extended to sports skewing to boys vs. girls and team versus non-team sports. This suggests possible underdevelopment against girl-skewing sports, a potential opportunity for sponsors. About the Study: Canadian Youth Sports Report provides a comprehensive overview of 44 sports and emerging popular physical activities for the 3-17 age group representing a population of 5.9 million, for the first time in Canada. The data comes from 2,371 thirty-minute online diary interviews with parents who had at least one child in the 3-17 age group in the home. This landmark study was conducted over a period of 5 weeks in November/December 2013. The sample is nationally representative and in addition to English and French Canada, it captures views of 440 new Canadian families, including the fast-growing Chinese and South Asian groups. Canadian Youth Sports Report is an independent syndicated study published by Solutions Research Group (SRG). For more information, please contact Robin Dryburgh, robin@srgnet.com.